(CRC Press 2011) - Selected for Intel Recommended Reading List. Topic themes include Cloud, Server, Storage, Virtual, Network, Data Protection among others. (CRC Press 2009) - Selected for Intel Recommended Reading List. Topic themes include Efficient, Effective, Productive, Economics, Cloud, Virtual, Power, Cooling, Data Center among others. (Elsevier 2004) - SNIA Education Endorsed Reading. Topic themes include storage, I/O, capacity performance planning, management, SAN, NAS, WAN, MAN among others. Data Infrastructure Server StorageIO in the news industry trends perspectives commentary topics include SDDI, SDI, SDDC, Cloud, Serverless, Container, Server, Storage, network, NVMe, SSD, Flash, 3D XPoint, Enterprise, SMB, SOHO, Consumer, Data protection, Backup/Restore, BC, BR, DR, HA, Security, Applications, Big Data, AI, ML, DL, IoT, Management, training, education, tools, technologies, events and related items. Data Infrastructure Server StorageIO Events and Activities include live in person (along with recorded), Webinars, Seminars, Keynotes, Chat Sessions, Videos and other activities pertaining to Data Center, Data Infrastructure, Server, Storage, I/O Networking, Hardware, Software, Services, Tradecraft Techniques, Tools, Technologies, Trends topics. Tip - Out of capacity - what now? 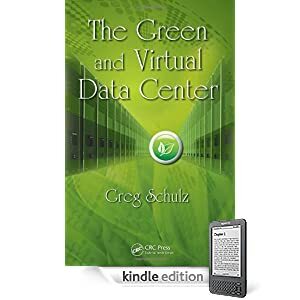 Some of the buzzword, themed topics and technologies on this page include among others Archiving, Backup, Business Continuance (BC), Capacity Planning (CP), CAS, CDP, Classification, Clustering, Database, Data Protection, Disk Based Backup, Disaster Recovery (DR), Encryption, Fibre Channel, FICON, Grid, ILM, iSCSI, MAN, NAS, Networked Storage, Object Storage, Performance, RAID, SAN, SAS, SATA, SCSI, Security, SNIA, SRM, Storage Devices, Search, Storage Management, Storage Software, Storage Systems, Switches, Tape, Virtualization, VTL, WAFS and WAN. Note: On-demand webcasts may require registration and subject to change without notice. Spring 2006 Minneapolis Regional CMG "Storage Industry Update"
Spring 2006 "Server and I/O Perspectives, Issues and Industry Trends in a Virtual World"
Regional & international events Rocky Mountain, CMG Italia (Rome Italy), National Capital Area, Minneapolis-St. Paul. 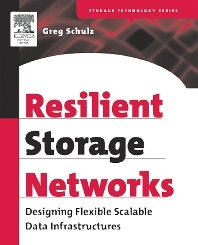 Book review of "Resilient Storage Networks"
"Resilient Storage Networks" Elsevier/Digital Press Books) is a book written and illustrated by Greg Schulz. Resilient Storage Networks looks at storage and storage networking from a technology, and vendor neutral standpoint including coverage or performance, capacity planning, security, design, topologies and scaling, local and wide area, storage software, storage management, lifecycle management (ILM), data protection, data access among other topics. ISBN 1555583113, Paperback , 443 pages, Approximately 150 Illustrations. Click here to see where to purchase your copy of "Resilient Storage Networks" SNIA Endorsed Reading. Greg present examples, tips, and recommendations on how SMBs can proactively protect their data and information from various threats. Note: Webcasts & tips may require registration and subject to change without notice. Webcast - SAN and NAS integration - May 30, 2000 Note: This was second on-line event ever held at SearchStorage! Webcast - 10 steps to foolproof data protection - December 10, 2004 Greg discusses backup and recovery options such as disk-based backup and disk-to-disk-to-tape. He'll also cover mirroring and replication techniques, archiving and managerial business continuity process and procedure. This lesson gets into the real nuts and bolts of storage management and how to accomplish those tasks more efficiently. This SearchStorage Webcast takes a look at reasons for scaling a storage network along with various techniques, technologies and examples to scale a storage network on a local and wide-area basis. Webcast - Windows Storage 101: Part I - What are your storage options? - March 30, 2005 This webinar provides an overview of storage-related topics for Windows-based environments. Among the topics we will cover include Windows-based storage options, data protection and storage management techniques. Webcast - Windows-based Storage 101: Part II - Your data protection options - May 4, 2005 This Webcast provides an overview of data protection topics and options for Windows-based environments. Among the topics we will cover include Windows-based data and storage threats, data protection techniques and options. Note: On-demand webcasts may require registration and subject to change without notice. Dallas TX - Oct 2007 - Presented "Beyond Green wash - Power, Cooling and Green Storage"
Greg Schulz wrote the SAN and MAN/WAN networking chapters. Co-presented at Veritas Visions "The Resilient Enterprise"
Greg Schulz provides commentary on storage virtualization technologies and techniques from an storage industry analyst perspective. Greg Schulz contributed the SAN and MAN/WAN material for this project. Visit our downloads page to view various presentation and related material. Contact StorageIO at [email protected] or +1 651-275-1563 to discuss how we can assist with you with custom presentations, keynote, pod cast or web casts, interviews for your story, article, blog or other project needs requiring industry and technology subject matter expertise (SME) perspectives. Media, press, editors, producers, event coordinators, press release support and commentary, free lance writers, reporters and bloggers send your requests via email and indicate your deadline so that we can accommodate your schedule and timeline. Learn more about our other services here. StorageIO(TM) is a registered Trade Mark of Server StorageIO and UnlimitedIO LLC. © 2006-2019 Server StorageIO and UnlimitedIO LLC All Rights Reserved.